I was asked to participate in an interesting collaborative project called the Project 100 which was started by consumer marketer Jeff Caswell last month. It’s a simple concept. 100 authors. 400 words each. 1 Collaborative Book on “Project 100: Marketing in the Social Media Era”. I will publish the book using Blurb.com and all proceeds will go to support Susan G. Komen for the Cure. I am not doing this for the money. I am doing it because I think its cool, I am interested in what marketing leaders are thinking and I believe in Susan G. Komen. I agree with all of those thoughts and the tough part for me was coming up with just 400 words. I’m sending my submission off to Jeff tonight and thought I would share my thoughts in this blog post too. Marketing in the social media era represents a dramatic change from marketing in the ‘old-style’ push era. One of the more visible ways that a company can participate in social media today is to build a community around their products and services. The key functions of a community are to share up-to-date information with customers and prospects, to have interactive conversations with customers, and for customers to interact with and provide support to other customers. 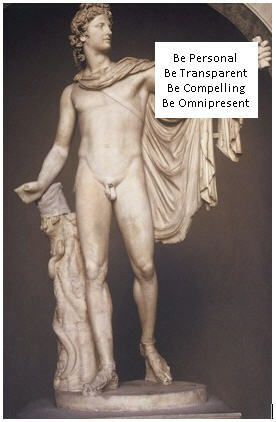 Be transparent – It is critical to be totally transparent with your community efforts. This means that all communication needs to be both open and honest in order to build the inherent trust that is necessary for people to begin sharing with you. Be personal – Communities must make the communications personal. What this means is that the company and social media managers generally need to lead the way and share first by posting personal profiles and contact information. Be compelling – The community experience must be compelling enough for people to want to come back. So, it is important to focus on both the big and little things to ensure that people have a pleasant and valuable experience. The usability of the site, content and discussions must be interesting enough for people to visit more than once – and to have them recommend the experience to their network. Maintaining frequent communications with your members is also critical. Be omnipresent –The community must be wherever your users want it to be. While you may have community elements on your website, you also need to provide ways for users to interact and get the latest community news and updates. This goes way beyond having RSS feeds for the key content on your site. For example, your community needs ways to duplicate the community experience in the leading social media sites such as Facebook, LinkedIn and Twitter. By making it easier for community to participate, you will make the community stickier in the long run. Once you master the ideals, the community work is only starting. Communities must be actively promoted, managed and supported in order to be successful. There is no such thing as “build it and they will come” in the social media world. Building and sustaining a community will require a great deal of heavy lifting and dedication, but the end results will be worth it. 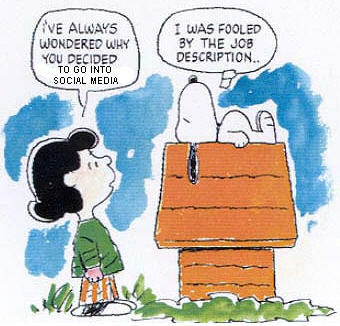 For one of my projects this week, I had to create a social media job description. I did a quick search on Google and on various job boards, but I didn’t like any of the descriptions that I saw. So, I wrote my own “perfect” job description which could be viewed almost as a checklist. I think the responsibilities should be stated in fairly broad terms without getting into specific tools or techniques. I also don’t like job descriptions that specify a number of years of experience. Instead, a social media expert should be able to point to his body of work – through his blog, his Twitter feed, his LinkedIn profile or Facebook page – and that should be sufficient proof. Finally, a list of key attributes is essential to get an understanding of the candidate’s personality. Besides me, does this description fit anyone you know in social media? Let me know what you think or add your suggestions in my comments. The most important part of this job is that the candidate must have demonstrated and extensive social media experience. This means that the person is actively participating in a wide variety of social media activities such as blogging, community development and management, social bookmarking, commenting, etc. and is well-connected with the broader social media world. The second important part is that the candidate must be able to think strategically, but be willing and able to roll up his sleeves to help implement the programs. My latest project finally launched today. 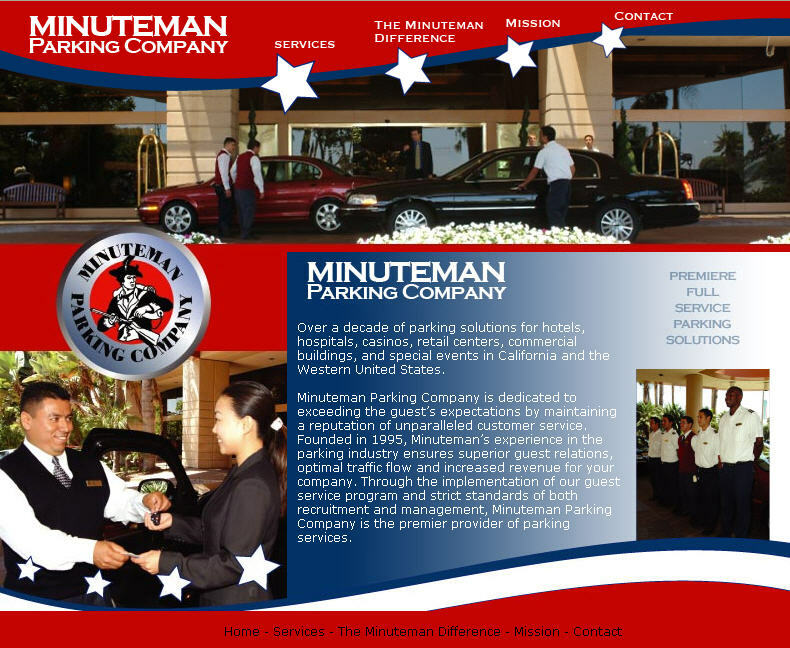 Chris Fox is a longtime friend of mine and he runs a valet parking company called Minuteman Parking in the Los Angeles area. For the past 2 months, I have been helping Chris update his website and marketing messages. In the process, I learned a lot about the valet parking business and discovered the fun and challenge of consulting with small businesses. Chris’ business is pretty unique. While he services more than 30 locations in the Southern California and Seattle areas with more than 600 employees, he really only has about 10 people on his ‘headquarters’ staff. So, I became his ‘hired’ marketing expert. The executionists of Marina Del Rey, California provided the design for the website – and while they have an unusual name, their team lead by Temy Gu did a wonderful job “executing” the concept. Updated design and theme – We have to thank our web design team for coming up with a new theme and color scheme. It was important to keep the patriotic idea linked to the company name, but the old site was very early 2000’s in look and feel. The executionists added some flash to the home page and added pictures to the other pages which help to personalize the company. 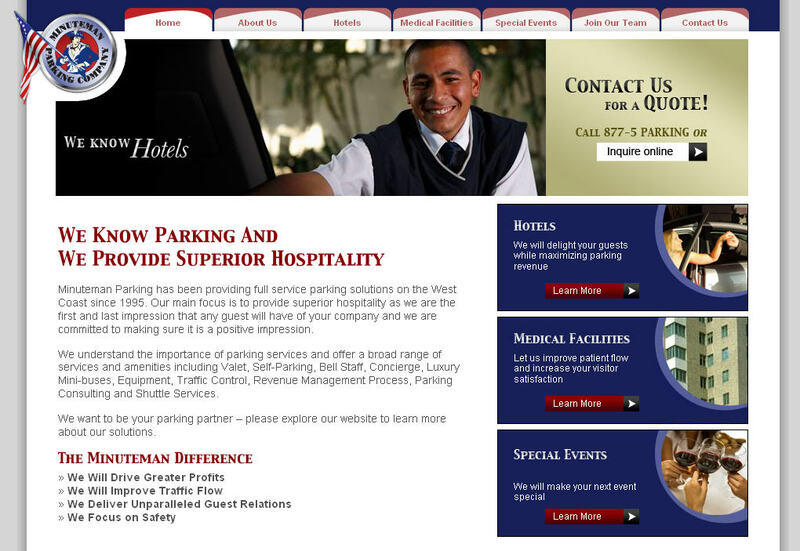 Simplified messaging – Chris and I worked to simplify the messaging for his key business lines of providing customized parking solutions for Hotels and Medical Facilities. He also wanted to capitalize on a new business line of Special Events and we incorporated that into the menu structure. Company blog and news – I finally convinced Chris about the importance of keeping content current in his website and we had the executionists incorporate a blog into the new site. You can find the blog under About Us->News. Now I have to hold Chris to updating the blog and news section on a weekly basis. Clear actions – We put clear actions on the landing pages and key solutions pages. And we gave people many options for contacting Chris’ team via email, web form and toll-free phone number. Customer list and testimonials – We added a list of customer logos and several short customer testimonials. Chris has some name-brand properties and we listed the corporate brands without having to identify the specific locations. The customer list and testimonials should provide Chris with a better way to get his foot in the door at new prospects. Check out the website and let us know what you think. And thank you Chris for listening to me and trusting me with your business. I am working on a project for a digital media company and part of the project is to research the latest trends on social media in the military. I ran across some interesting information and links, and would like to share them so others can see the progress being made by our military institutions. All of this begs the question – if large traditional and conservative organizations like the US Army are experimenting with social media, why aren’t you? US Army – Leading the charge for the Army’s social media initiatives is LTG William Caldwell of the Central Army Command at Fort Leavenworth. He published a memorandum in April directed to all personnel under his command at the CAC including CAC subordinate organizations. Interactive internet activities are an essential part of our responsibilities to provide information to the public, usher in a culture of chage within our Army’s officer Leadership, Development and Education and support military operations. Leaders within the Army need to understand the power of the internet and leverage as many communications as a means as possible to community what the CAC is doing, and more importantly to “Share the Story” of those serving in uniform and highlight the incredible sacrifices they and their families are making. We’ve got to embrace every form of media, and this new medium – and particularly blogging, for many people – has replaced traditional media as a way to get news. And not only to get news, but to educate themselves, the back and forth that blogs offer. So I see it as an addition of what we’re doing, and a mechanism to reach some people who you don’t reach at all through so-called traditional media. Today we activated several new social utilities to help the Coast Guard as an organization, and myself as the Service Chief, to better communicate and collaborate, both amongst ourselves and with the many publics we proudly serve. Included in the Coast Guard social media initiative are the following sites. US Navy Website for Heroes – Taking a different angle, the US Navy has created a website called Websites for Heros that allows for deployed Navy and Marine personnel to maintain close family ties with their loved ones beyond the occasional phone call or e-mail. The Department of Defense blocked many popular social networking sites last year to protect internet bandwidth for mission-critical functions, so this site fills the void to keep families connected. More on the program is available from this press release. One way that leaders are connecting in conversation is through online professional forums (aka online communities) like the Company Command (CC) and Platoon Leader (PL) forums. These forums bring together leaders from across the Army to share ideas and experiences and to improve our collective effectiveness. The PL forum specifically also gives cadets at West Point and in ROTC unprecedented access to the ongoing conversation of the profession they are preparing to join. The program sounds like a great way to share important information with up-and-coming military leaders. Milblogging – Finally, there is a website called Milblogging that serves as an index of more than 2000 blogs written by military personnel from around the world. If you are looking to read personal accounts of what is happening in Iraq, Afghanistan and elsewhere, this is a great place to start. I am sure there are other initiatives in the military, but these are the ones that crossed my path in the last week. If you know of others, please add them in the comment section. In this TED Talk from 2007, marketing guru Seth Godin talks about Wonder Bread and other marketing delights. His premise is that ideas that spread will win and he refers to the current time as the “Century of Idea Diffusion”. Seth goes on to say the the “TV industrial complex” is not working any more. Consumers don’t care about companies because they have way too many choices and too little time – so they just ignore stuff. Which means that you or or your message must be remarkable to stand out from the crowd. He also brought up the Japanese concept of otaku – which is used to refer to people with obsessive interests. Ideally, you want to cultivate people with otaku for your product or service because they will help you spread the word. It’s advertising when people do not care about the message. The trick for brands is to make people interested in the message. One way is to leverage social media outlets and find people who’s opinion matters and is trusted by a group of people. Then the natural filtering mechanism of friends, family and colleagues will take over and help you disseminate your message as ‘information’. 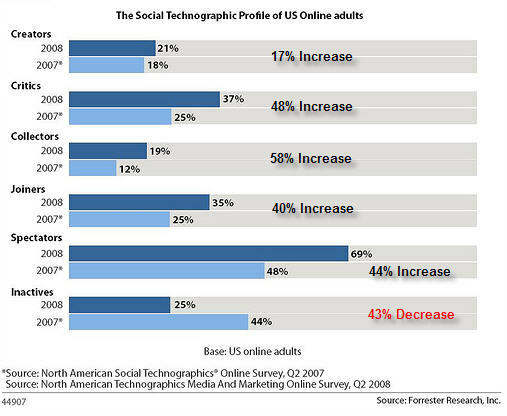 Josh Bernoff and his social media Groundswell colleagues at Forrester have just released their 2008 Social Technographics data – and the results show that there is a rapid increase in participation in all types of customers and across all age ranges. Forrester counts someone in a group if they do one of the activities at least monthly and their ladder is more fully explained in this short presentation. As shown below, all categories showed increases from 2007 to 2008 except for the Inactives which went from 44% to 25% – a 43% decline. This is one of the most telling statistics from the research as it shows that people are getting off the couch and are starting to participate at least as spectators. Even though the Creators segment showed the slowest growth, it did show some pretty impressive gains especially as these users are the most committed social media advocates. Forrester also analyzed the statistics on an age basis. While Forrester didn’ disclose all of the age-related statistics, they did identify that the growth in social media consumption is coming from the 35-44 year old crowd especially on the Spectators and Joiners rungs of their ‘ladder’. Forrester has also updated their interactive social profile tool that lets you examine the data by age range and country. The complete report (The Growth of Social Technology Adoption) is available from Forrester for $279. What does it all mean? It means that social media and content is going mainstream. And it means that it will be increasingly more difficult for companies to ignore the social media phenomena.